Creepoid Unveils Adam Wallacavage-Directed Video From No Idea Records LP, On Tour Now! Creepoid has released a music video for “Yellow Wallpaper,” a track from their self-titled LP that came out on No Idea Records earlier this year. I hadn’t heard material off this new LP before the video came out but I’m really enjoying it, as it has a feel similar to post punk/shoegaze and that’s a very good thing. Creepoid recently finished a tour with Against Me! and are currently headlining shows with Tennis System acting as direct support. Check out the full list of dates below. Creepoid has unveiled the video for “Yellow Wallpaper” from their self titled LP on No Idea Records (see Noisey debut), which is famed sculptor/photographer Adam Wallacavage’s directorial debut alongside cameraman/editor Erich Weiss. The band is currently on tour with Against Me!, and they will be following it up with headlining dates with Tennis System, as well as dates with Balance & Composure and Seahaven. Adam Wallacavage’s chandeliers have been exhibited in galleries in São Paulo, Rome, London, Miami, Los Angeles, Philadelphia, Vienna and New York and have been featured in publications such as The New York Times, New York Magazine, Vice and TIME Magazine. Beyond making sculptural works, Wallacavage is also an accomplished photographer whose “Monster Size Monsters” book documented fifteen years of his photography. Creepoid formed during a snow storm in December of 2009, born from boredom and cabin fever. The band consists of Sean Miller (guitar) Nick Kulp (guitar) Anna Troxell (bass) and Patrick Troxell (drums). 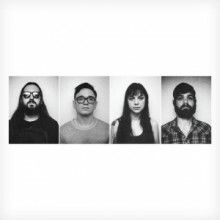 The Savanah-by-way-of-Philadelphia band mine the quiet side of breathy acoustic / slowcore, then erupt into heavy, hard hitting distortion – winning them comparisons to artists like Nick Cave, Red House Painters, Sonic Youth, and My Bloody Valentine. They recently released their long-awaited self titled sophomore LP with No Idea Records, garnering praise from the likes of Spin, Noisey, Impose, Wondering Sound, Alternative Press, Brooklyn Vegan, WXPN, and many others. Pop. 1280 shares new music video + west coast tour dates!